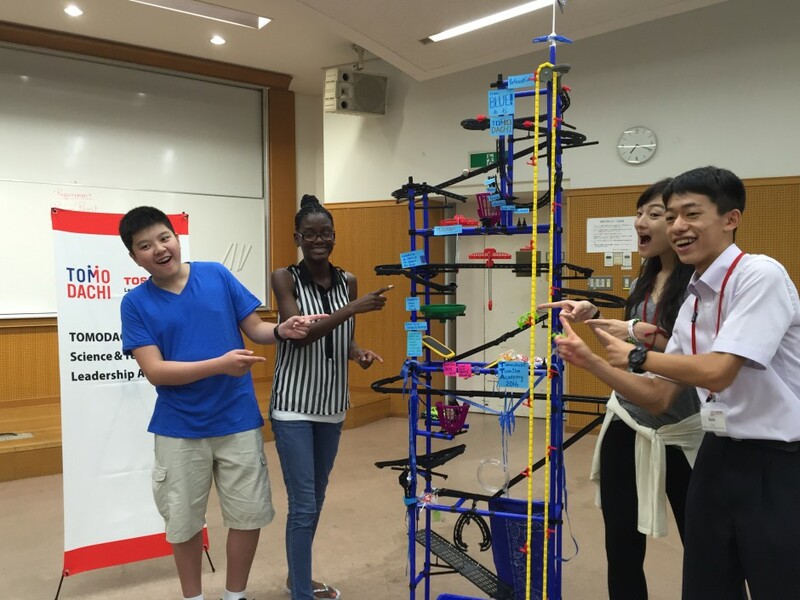 The 2016 TOMODACHI Toshiba Science & Technology Leadership Academy Concludes with Strengthened Ties Among Students and Teachers from Japan and the U.S.
From July 31-August 7, 2016, 16 high school students and eight teachers from Japan and the United States came together at Yoyogi National Olympic Center in Tokyo on the TOMODACHI Toshiba Science & Technology Leadership Academy. United by their shared passion towards Science Technology Engineering and Math (STEM), the participants were driven by their borderless aspiration to create a disaster-resilient global community. The various group activities were planned under the theme, “Developing Resilient and Smart Communities”, in which the students were split into four teams and explored how science ensures global safety. They were given introductory lectures on smart communities, the present and future of technology, and disaster mapping, as aid for their analyses and final presentations to be shared at the closing ceremony. As a hands-on project and experience, each team competed in elevator building. They were given a starter kit of equipment, in which the true challenge was to construct an innovative but safe elevator. Each student expanded his or her problem-solving abilities and understood the importance of teamwork and togetherness to achieve success. In the end, each team expressed their own individuality and take on the task, while also learning from needed improvements in design efficiency, and construction. On another day, Mr. Taichi Furuhashi from Aoyama Gakuin University introduced the group to disaster mapping and MAPS.ME, a smartphone application that provides detailed maps of all countries without the need of Internet access. The students had the opportunity to use this platform to explore the construction of Yoyogi National Olympic Center, and analyze the variables needed to produce easily accessible and comprehensible maps, especially during natural disasters. Outside of classroom activities, the group of students and teachers explored Toshiba’s leading innovations in Tokyo. They made visits to Toshiba Science Museum and rode Toshiba-built elevators at Tokyo Skytree, as an inspiration to further explore the technological field and acquire global skills and mindsets needed to thrive in a more cooperative, prosperous, and secure world. Along with the closing ceremony, the student teams gathered their findings throughout the program into a final presentation. As the next generation of leaders, their in-depth analyses and reflections on smart communities was a promising preview for what they are bound to accomplish in the future. Through collaborations on various projects and cherishing explorations of Tokyo, the students not only enhanced academic knowledge, but also made life-long friendships that undoubtedly will progress U.S.-Japan relations.